NOTES: Beautifully moulded. Inexpensive. Thick decals. 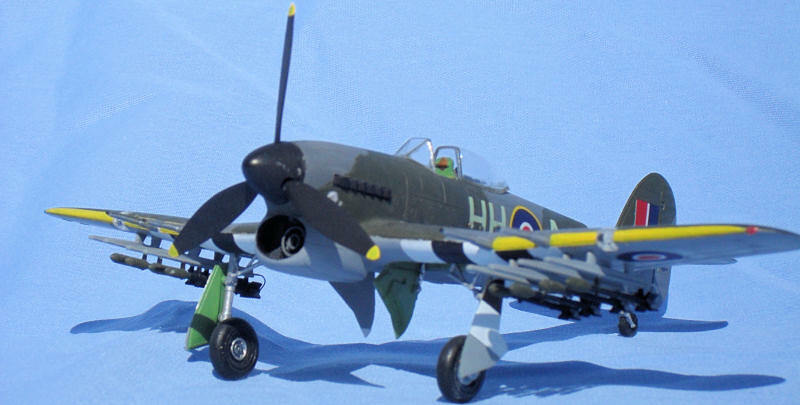 Designed as the replacement for the Hawker Hurricane fighter, the Typhoon was rushed into service and proved to have a few airframe and engine teething problems that needed resolution. By the time they were fixed, a modified version was also being produced as the Tempest. So the Typhoon was adapted into service as a ground-attacker, with its 4 x 20mm cannon supplemented by 8 x 60-pound rockets – the same weight as that fired by an 8” Navy cruiser’s broadside (they fired 60-pound shells). It was in this role that the ‘Tiffie’ earned its fearsome reputation as a tank and train buster. As a side note, pilots found the transition from Typhoon to Tempest very easy, and after flying a Tempest, they suddenly likened the Typhoon a carthorse. 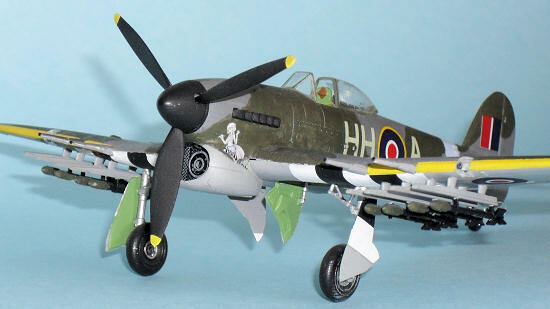 My 6 y-o son was accompanying me to my local hobby (read model) shop (LHS) when he spied an Academy 1/72-scale Typhoon. He latched onto it and pleaded with me to buy it for him. Well, I bought it for him (he’s irresistible), and a second one for me so that I could teach him about building models by building them in parallel (Like this, do that). For a blow-by-blow of what is in the box, see Scott Jamison’s kit preview. There’s nothing that I can add to Scott’s article. Building these models was pretty routine. We started with the office. Surprisingly little filler was needed on either of the models because the fit was quite good. I was even able to show my son some drybrushing by using the radiator and IP. He, of course, wanted to add tape seatbelts because I did. Normally, I woulda glued the upper wings to the fuselage, but I didn’t this time because he is a bit young to hold it all steady while it dried. Later. After only a few sessions, they were ready for painting. Both of us painted our Typhoons with Citadel Miniatures acrylic paints because my son is a bit young for MY airbrush, and the paints brush nicely. The belly was done with Space Wolves Grey, a light blue/grey. OK, I had to mask the fuselage & canopy for him before we used Fortress Grey, a dark grey, on the sides and upper surfaces. I copied the exact cam pattern onto the model by enlarging the painting diagram in a photocopier to the size of the model. The right patches/masks to cover the grey were cut out ensuring where possible, that there were tags still attached to each mask. These tags are used to attach the masks to the model. Some holes were punched in strategic places on the masks and tape was used to reseal these holes, and further served to hold the masks firmly against the model. We used Catachan Green, a dark green, as the second colour. I taught my boy to use short sharp brush-strokes from paper to plastic to establish a perimeter, then to fill in the rest. I only wish that he’d use less paint on his brush. I had to write-off three brushes because he kept stabbing them into the paint. Later. 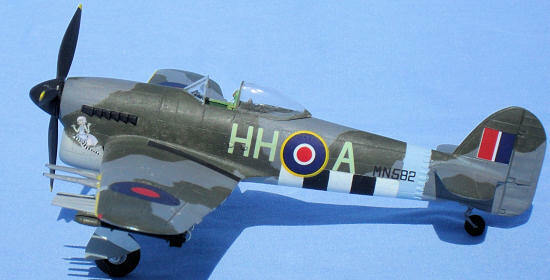 Both models were Futured in preparation for the decals. I will digress here because, while I allowed my son to merely attach his decals, I, on the other hand, still tried to do the job properly (‘cos I’m BIGGER than him). I started with an over-wing invasion stripe decal. It went on like a mitten – thick, non-conforming and proud of the surface, even after applications of Microset and Microsol. So (when my son wasn’t around) I painted them on using CM Skull white and Chaos black, with masks of 6mm Tamiya tape. The UC doors were held in position with blu-tac to get the striping right. But I didn’t have the capability to paint the rest of the decals and my spare decals couldn’t agree on a uniform set of colours, so I reluctantly used the kit decals. This time, I positioned them over puddles of Future Floor Wax, hoping that they’ed be sucked down into the engraved detail. Nope (Rats!!). More Future on and around them did not fix the problem. On advice from another modeller, I applied a sponge, soaked in near boiling water, over the top of them. This caused the edges of the decals to curl upwards, and the Future to turn white. (Double Rats!!). Having learnt the hard way, the rest of the decals went down onto a large puddle of Future, then they were off for an appointment with the hairdryer. This process seemed to work, but I am now gun-shy of Academy decals. At least I have a Wife I can count-on, who will always have a hairdryer I can count-on. 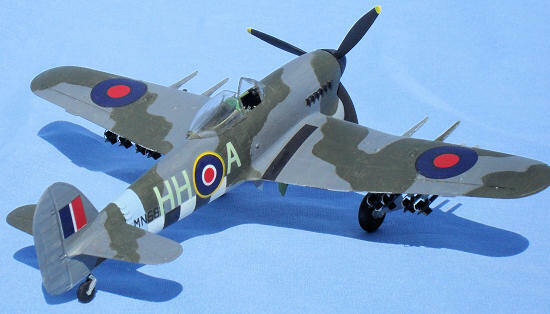 Other advice from modellers says that even decals that have been sitting on a model for years, can be beaten into submission (and engraved detail) by the application of gentle heat. The underwing rockets were a little tricky to position because they need to be vertical and parallel to each other. Once they were safely attached, I had the sudden urge to attach firing wires from the tail-pipe of each rocket to the rear of its rocket rail. I drilled fine holes in the rear end of the rails and the tails, then attached the tails. The rail/tail height was measured and I found a drill-bit of the same diameter. Eight lengths of thin wire were bent over the drill bit, trimmed to length, then the tips were inserted into the holes with superglue. There were no such problems with the UC legs and doors, though the rams that open the inner doors were a tad too long so that they lean inwards past vertical. But the inside faces are nicely detailed, and I LOVE the way that the propeller can be attached after final assembly has been completed. I dunno how long it took us, but my son & I enjoyed the build and the time together. Perhaps he never liked the paint job, because he gave it several coats, usually of differing colours. 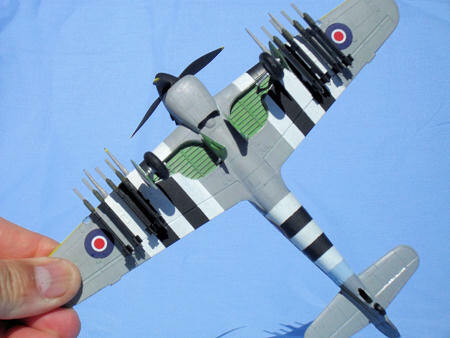 We both liked the way our respective models turned-out, and my son loves to blow the propeller around. If I was to build another, I’d start by procuring an after-market decal set, ‘cos the Academy ones are waaaaaaaaay too thick and rigid (and now I’m gun-shy of Academy decals from now on). 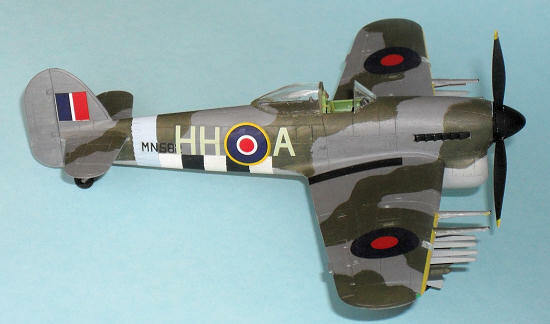 I gotta go now, because my son has acquired an Airfix Blenheim from my stash, and I’d better find another one for me. The box-top and kit instructions. PS: I have since learnt that Mr. Mark Softener is able to beat Academy decals down into engraved detail. I’ll have to start another Academy model so that I can test it.